JULIAN STATION: The Lacemakers LIVE and Lilacs Emerging! The Lacemakers LIVE and Lilacs Emerging! Lilacs are just getting their start up here in Julian! Although our groves have a few scattered flowers that I would call 'ready for pickin,' I don't expect bunches of lilacs to be available at Wynola Farms Marketplace until sometime next week. If you're on our lilac alert list, we'll send an email as soon as we're sure we have lilacs available. If you're not on our Lilac Alert list you can request to be added by emailing albert@wynolafarms.com. 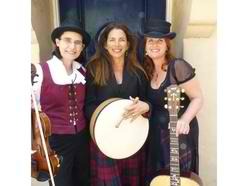 Now for music: Join us Sunday as we feature The Lacemakers as part of our ongoing Music at the Marketplace series. I describe them as an eclectic mix of bluegrass, a bit folky with a sprinkling of country and an Irish twist! Music will be inside the Marketplace from 1-4pm.